Toddy for Kids provides your growing child with a full spectrum of nutrients, including vitamins, minerals, amino acids and phytonutrients. 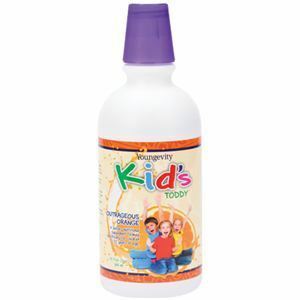 It is specifically formulated for children 2 to 12 years old and provides essential nutrients to support their development. It contains no yeast, dairy, wheat, soy, gluten, starch or artificial flavors. It also comes in an orange flavor that kids love! Directions: Children between the ages of 2-4 years should take 1/4 oz (1 teaspoon) twice a day with meals. Children between the ages of 4-12 years should take 1/2 oz (1 tablespoon) twice a day with meals. Children 13 and older can start taking full Toddy ™. Children Toddy ™ can be mixed with water or juice according to taste. Ingredients: Vitamin A, Vitamin C, Vitamin D-3, vitamin E, vitamin B-1, vitamin B-2, vitamin B-3, vitamin B-6, folic acid, vitamin B-12, biotin, pantothenic acid, calcium, iron, iodine, magnesium, zinc, selenium, copper, manganese, chromium, potassium, choline, inositol, grape seed extract, broccoli powder, Banana powder, carrot powder, Cranberry powder, super sweet corn powder, cherry powder, spinach powder, peach powder, tomato powder, purified water, natural vegetable glycerine, fructose, citric acid, sweetener, natural flavor, xanthan gum, potassium sorbate, sodium benzoate (to preserve freshness).